I hadn’t needed to mash the brakes in Mario Kart since skidding around the corners of Donut Plains 3 in the original Super Mario Kart over twenty years ago. Since then, brakes mean you’ve failed. You’ve stupidly hit a wall and need to make a U-turn, or you have two wheels hanging into space over the edge of a Rainbow Road. 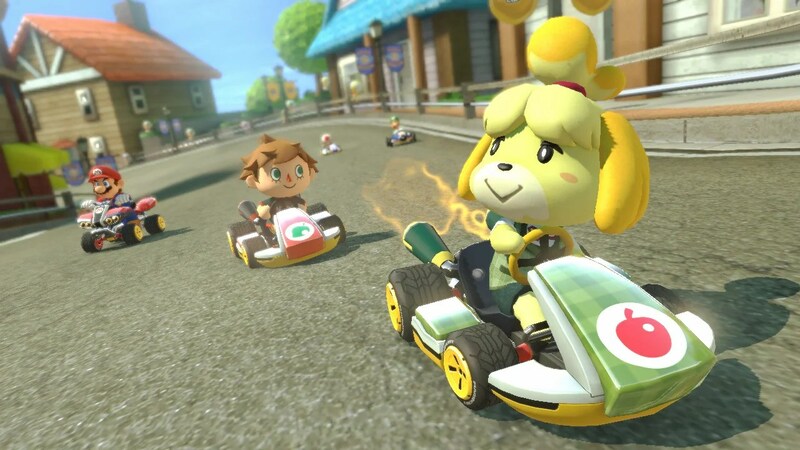 Mario Kart 8’s 200cc mode has changed that, and the need to slow down to move forward is just one of many ways this addition has changed the Karting game. When Mario Kart 8 released last year, I initially found it more fun to watch than to play. It’s easy to not notice the dizzying heights and crazy twists the courses navigate when you’re in the driver’s seat, but the dynamic camera in instant replays shows just how impressive the course design is. After watching the trailers and getting excited over the gravity-defying mechanic, I was disappointed. And the new Rainbow Road sucked. The first DLC pack in the fall kept things fresh with the Hyrule track and the Excitebike throwback, but DLC pack 2 has altered the way I look at Mario Kart 8. 200cc mode aside, the new karts and tracks are stunning. I love playing the Excitebike track as Animal Crossing Villager, because I first played Excitebike inside Animal Crossing on the Gamecube. As for the tracks, The Toy Story-inspired Ribbon Road makes me want all the tchotchkes rendered inside it. Super Bell Subway connects the world in a cunningly clever way. Wild Woods looks like the Shy Guys commandeered the Keebler Elves’ favorite tree. Animal Crossing is adorable and Baby Park is as hectic as ever. The now-requisite F-Zero track, Big Blue, is impressive too, especially at 200cc mode. The blazing fast speed changes pretty much every single track in the game. First, I never realized that you could brake and still power slide. Who knew? Not me. Also, the karts speed up, but the tracks don’t. The Thwomps fall at regular speed, and timed portions of certain tracks, like the rolling stone wheels of Thwomp Ruins, are much slower than normal, meaning I can’t do the hang glider portion down the middle of the lagoon in Thwomp Ruins until the third lap. The computer-controlled characters seem to be adjusting to the new speed too, often flying off the track or into a wall. I also fell off the edge of Wario’s Gold Mine, but ended up on a little safety track that I never knew was there. The sheer speed also affects jumps, making me hesitant to leap the boats in Toad Harbor or squeeze between the trolley cars and the wall later in the same track. Normally, I fly through there no problem, but now I frequently get flattened into a squishy San Francisco Treat: Toad Style. Nostalgia and excitement twisted together like the Mobius strip of Mario Circuit on the SNES Rainbow Road. In 200cc mode, I lapped someone. I probably hadn’t done that since the original, either.